In our regular feature Old v. New, Kimberly Marcela Duron compares a newer independent release with an older classic to see what similarities they share, how they diverge and hear what the conversation between the two films says about filmmaking as the art form continues to innovate and evolve. After watching a few Westerns it’s easy to pick up on what makes the good ones stand out: that gritty Old West spirit, exciting tales of frontier justice and (of course) the macho, rough-but-handsome gunslingers. I say “macho” because apart from the resident ingénue playing damsel-in-distress, 19th-century frontier life wasn’t particularly female-dominated—at least not as depicted by Hollywood). But there were exceptions, and then there was Joan Crawford. Crawford bought the film rights to a novel by Roy Chanslor and sold them to Republic Studios, thus beginning the production of the unlikely Western Johnny Guitar (1954). Despite its name, the film centers on Vienna (Crawford), a saloon owner who has big plans for the railroad expansion—plans vehemently opposed by a town mob led by Emma Smalls (Mercedes McCambridge). 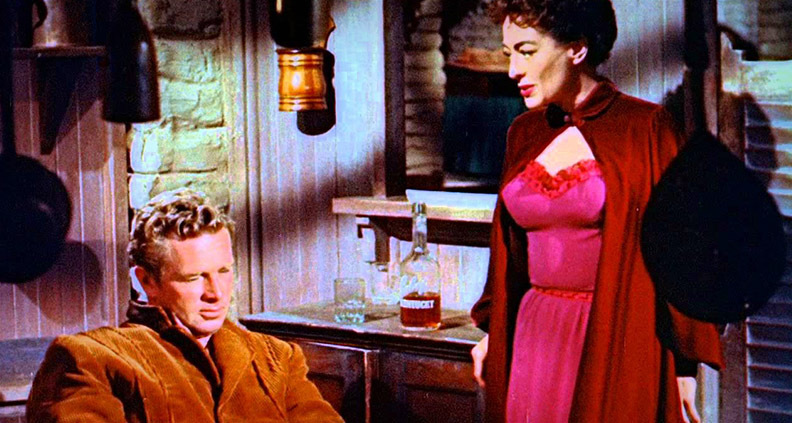 For protection, Vienna just happens to hire former gunslinger-lover Johnny Guitar (Sterling Hayden), who comes back to town to reignite their long-lost romance. Fun side note: Sterling Hayden couldn’t ride a horse, play guitar or shoot a gun, but that was irrelevant in the casting, since its Vienna who ends up being the center of the final showdown. Jane Got a Gun (2016), directed by Gavin O’Connor and written by Brian Duffield, Anthony Tambakis and Joel Edgerton stars 2017 Film Independent Spirit Award nominee Natalie Portman as the titular character, a woman who must protect her home and save her outlaw husband (Noah Emmerich) from the gang that’s out to kill him. She, too, enlists the help of a former flame (Edgerton) to be her gunslinger and their intricate relationship begins to rise from ashes. The issue of female assertiveness as an emasculating force is still there, but Vienna earns her respect. As she tells Johnny, “A man can lie, steal, even kill. But as long as he hangs on to his pride, he’s still a man. All a woman has to do is slip once and she’s a tramp! Must be a great comfort to you to be a man.” It’s interesting to note that Vienna’s antagonist is not a man at all, but another woman, Emma, who acts as a foil. Emma is also a stubborn woman who makes off-putting demands of her men, but her motives aren’t the same. Emma’s rage toward Vienna stems quite possibly from a place of envy, not only at her success as a business owner, but also, it’s insinuated, because the outlaw Emma is in love with (Hayden’s “Johnny”) actually loves Vienna. By contrast, Portman’s Jane Hammond is actually quite soft—especially compared to the stern Crawford. But it’s made very clear she can tend to her husband’s bullet wounds as easily as she can she can shoot them into her enemies. Another interesting link between the films is the way the protagonists enlist the help of men. Upon seeing that her husband is paralyzed, Jane rides her way through the dusty desert to hire Edgerton’s Dan Frost to be her gunslinger in the imminent showdown. Drunk and heartbroken by Jane, whom we later learn is his former fiancée, Dan rudely turns her away. However, he shows up a few scenes later when Jane is caught by one of the gang members out to get her. In Johnny Guitar, Vienna sends for Johnny because she knows about his days as a gunfighter during their time together, which ended when Johnny couldn’t commit. After five years, Johnny is likewise heartbroken and almost resentful at the sight of Vienna’s success. For these reasons, he initially refuses to help her fight. Like Dan Frost in Jane, Johnny comes back after a change of heart. In both films, the man seems to realize that his woman is going to try and protect her land at all costs with or without them. And ultimately, they each choose to be in the picture. Switching the gender roles is these films’ biggest genre departure, but the socio-political commentary embedded within each makes them even further unique. The script for Johnny Guitar, for instance, was credited to Philip Yordan. But the actual writer was Ben Maddow, one of the screenwriters who was blacklisted during the McCarthy-era Communist witch-hunts of the late-‘40s/early-‘50s. Vienna and her former lover parallel this hysteria when they’re wrongfully accused of a crime and persecuted without fair grounds or evidence—the townspeople simply didn’t want them around. Jane Got a Gun, on the other hand, delves into the damaging effects of war on relationships through Jane and Dan, who was taken to prison camps during the Civil War. Ultimately, despite the ill-fated production both films endured (which led to initially unenthusiastic reviews) the depth each provides makes for a pair of great films. To learn more about Film Independent, subscribe to our YouTube channel or follow us on Twitter and Facebook. You can catch up with the rest of our blog here. To learn how to become a Member of Film Independent, just click here. The 2017 Film Independent Spirit Awards will be held Saturday, February 25 on the beach in Santa Monica and broadcast LIVE on IFC at 2:00pm PT / 5:00pm ET. For more information on how to watch, click here. 2017 Film Independent Spirit Awards Winners Announced!